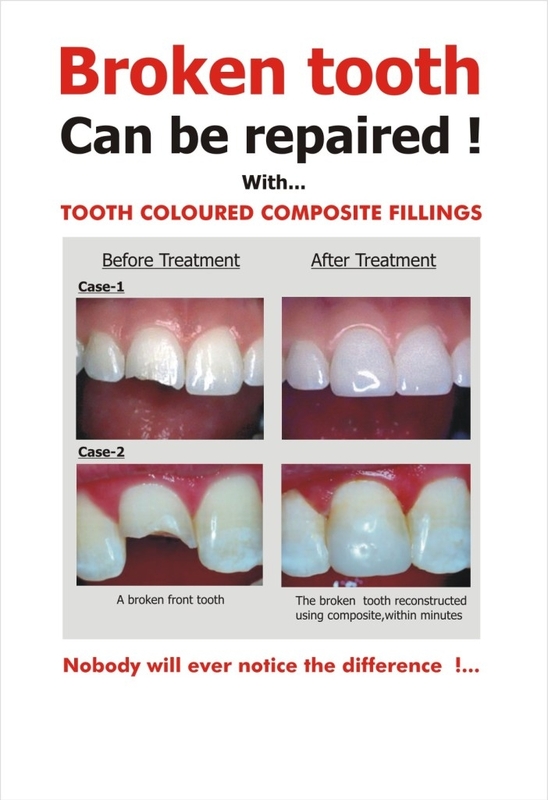 Tooth colored fillings (Composite Restorations): Tooth color fillings are used to fill teeth that have decayed, or to cover parts of teeth for esthetic reasons. They are held to the teeth with bonding agents. The materials do not stand up to biting forces as well metallic (silver or gold) fillings, and so are of limited value in the back of the mouth. The shades may match closely but may not match perfectly. Although it is not possible to predict success for individuals, the average lifespan for a tooth colored filling is 4 years, but failure may occur sooner. A strong bite, large fillings or decay can short the longevity. Smoking and tea or coffee drinking will stain t] fillings. Decay will occur around the filling if good plaque control absent. If failure occurs you will be financially responsible for retreatment.